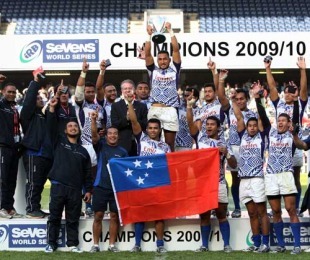 Banking giant HSBC has been named as the first title sponsor of the IRB Sevens World Series. The deal is another boost to the sport a year after it was granted admission to the Olympic Games from the 2016 staging in Rio de Janeiro. Leading international teams, including New Zealand, series champions Samoa and England, are also set to compete at this month's Commonwealth Games in New Delhi. The five-year deal will begin with the Dubai Sevens on December 3-4 before stops in South Africa, New Zealand, the United States, Australia, Hong Kong, England and Scotland. "These are very exciting times for our sport, and this deal will benefit rugby at all levels," IRB chairman Bernard Lapasset said. "We look forward to working in close collaboration with HSBC to further the promotion of the game in new and existing rugby markets as we count down to sevens' Olympic Games debut in 2016."